Pictured with optional hose kit. Noted as the “World's Quietest". Billy Goat's new 33" QUIETVAC™ touts the lowest noise level in its class and features unique cyclonic filtration, along with exclusive dust sock technology that dramatically reduces dust in dry conditions, and takes our industrial class hard surface unit to the next level. The unit replaces our legacy VQ series and is ideal for wide area commercial, industrial and municipal cleanup applications such as tarmac, school campuses, hospitals, hotels, parks, churches, airport pedestrian areas, resorts, city streets and sidewalks! QUIETVAC is the first pedestrian vacuum that has a shift-on-the-fly, hydrostatic transmission with infinite forward and reverse speeds making the unit nimble and easy to maneuver in tight areas, wide open areas or while driving or pushing manually. Unique Cyclonic Filtration: When combined with the Dust Sock™ the result is dramatically reduced dust in dry conditions providing the ultimate in operator comfort. 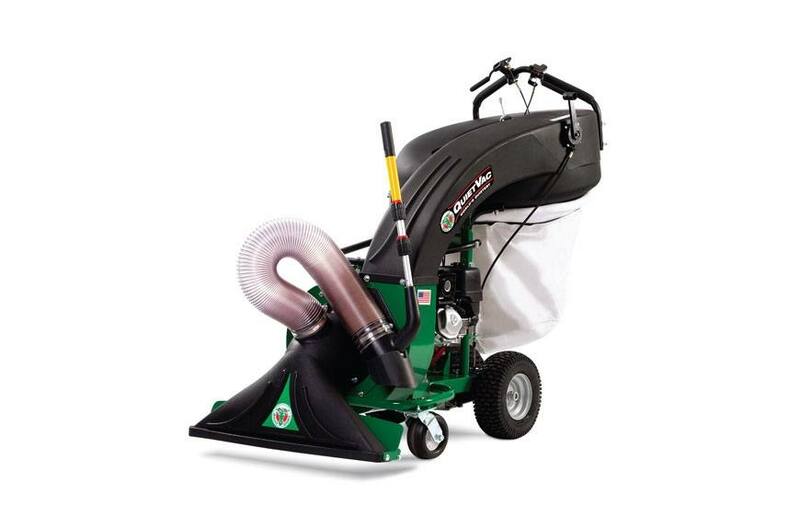 Powerful Suction: Unique volute housing and fan system provide the best suction power of any litter vac on the market today. Turf Bag: Large 36 gal. capacity. Add dust sock for minimal dust in dry conditions. Hydrostatic Drive Option: Self-propelled hydrostatic drive from 0-3 mph with infinite forward and reverse. 4-Latch Bag System: Loading and unloading is fast and easy. Running change, late 2014.